There is no "preview button". Note the text and formatting I typed in the question field (labeled "body" in the image below). Also note that directly below the question field ("body") in which we type/format a question, is a preview of the text/formatting as it renders, from the question field. We observe that the title is not available for preview, in terms of how it will appear in the posted question. One can always copy and paste the title and insert at the very top (or bottom) of the body, prior to posting, to ensure it renders properly, and if edits to the title are needed, edit. Then before submitting the question, simply remember to remove the copy and paste of the question in the body, and you are good to go. Note that my screenshot comes from a notebook pc; I cannot speak for previews on mobile devices. Not the answer you're looking for? 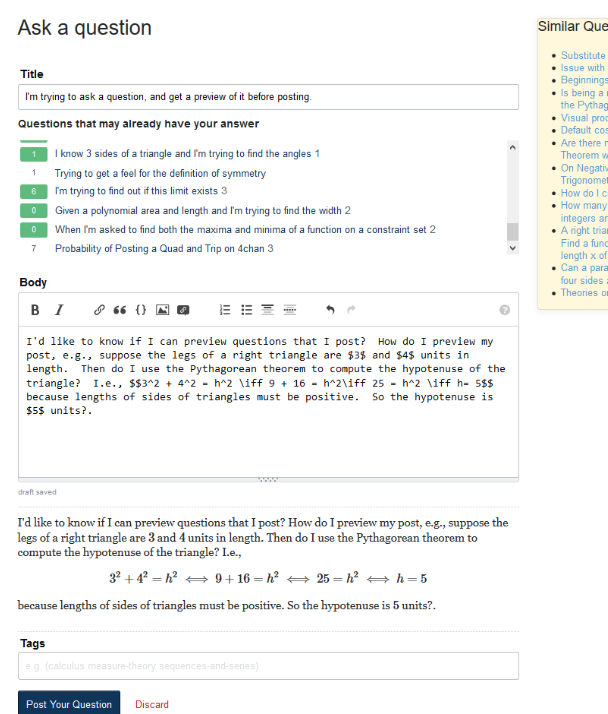 Browse other questions tagged discussion support asking-questions markdown-preview . Posting a question that was solved before being post.